Geoffrey Andrews is a self-described aerospace and aviation nerd. He dreamed as a little boy of traveling at hypersonic velocity – five times the speed of sound. Global icon Neil Armstrong visited his alma mater Purdue University's campus for various occasions through the years. The 1955 Purdue graduate is portrayed in the biopic "First Man." So it’s no surprise that Andrews ended up halfway across the country from his hometown of Long Valley, New Jersey. He is at Purdue University, college home to 24 U.S. astronauts including the most famous of all, Neil Armstrong. On Oct. 12, “First Man,” an account of Armstrong and NASA’s work on the Apollo 11 mission, which landed on the moon on July 20, 1969, will open in movie theaters across the country. But first, in recognition of Purdue’s place as Armstrong’s alma mater and as the Cradle of Astronauts, the university’s College of Engineering partnered with NBCUniversal to host two advance screenings of “First Man.” The screenings were shown in two packed theaters at a local movie house. A third upcoming screening is invitation-only at a local cinema. The screenings are Giant Leaps events, part of the yearlong celebration of Purdue’s 150th anniversary. Because of Armstrong’s moon landing and his legacy, Giant Leaps is the name of Purdue’s Sesquicentennial campaign. The year will highlight Purdue’s remarkable history of giant leaps, while focusing on what giant leaps the university can take to address the world’s problems. Andrews, a co-op student at NASA’s Glenn Research Center, where he has worked on hypersonic propulsion systems, has his own giant dreams. 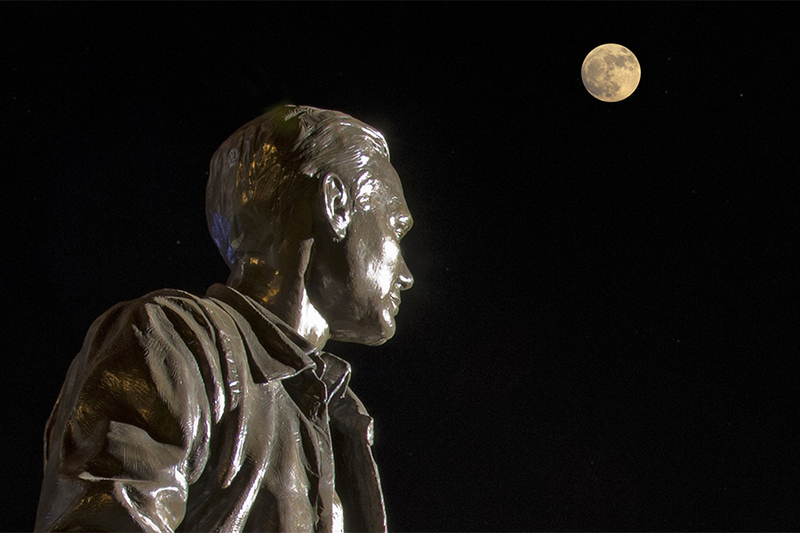 A full moon hangs over the sculpture of Neil Armstrong in front of the classroom building named for the iconic Purdue graduate on the university's campus. The Neil A. Armstrong Hall of Engineering was dedicated and the bronze sculpture unveiled in 2007. In fact, Purdue’s long history isn’t confined to outer space. Thousands of other Purdue alumni have and are working in numerous segments of the space industry. Among them, Mark Geyer is director of NASA’s Johnson Space Center; Amy Ross, daughter of alumnus astronaut Jerry Ross, designs the gloves used by spacewalking astronauts. Armstrong graduated from Purdue, earning his Bachelor of Science degree in aeronautical engineering. He was an ardent Purdue supporter throughout the years until his death in August 2012. A YouTube video and photo gallery are available. He co-chaired a major fundraising campaign with fellow astronaut and Purdue alum Eugene Cernan, the last to set foot on the moon. Armstrong made many public appearances at the university and lent his name to the Neil A. Armstrong Hall of Engineering. A statue of Armstrong as a young student and a replica of his footprints on the moon grace the entrance. The footprints show how far Armstrong could step in the low lunar gravity. Purdue also is home to hundreds of thousands of personal documents, working papers, memorabilia and photos from the 1955 graduate’s life. The collection includes approximately 70,000 pages of fan mail, which Armstrong continued to receive from around the world for years after he landed on the moon; his Purdue student notebooks and project reports; speech manuscripts; and NASA missions training, execution and results documents. These materials are available for scholarship and learning at Purdue Libraries’ Division of Archives and Special Collections.